Many thanks to all those who played their part in making this an extremely enjoyable OS/OA race weekend with the added bonus that the Newton-Carter Trophy was regained by a victorious OS team! 61 runners in total gathered at the bottom of the avenue consisting of 8 teams (OS, OA and 6 school teams) as well as many more supporters. The conditions were as perfect as one could dream for in February in Lancashire – cold but bright and with not a cloud in sight! The race began at a fair lick, across the golf course and down through the river before heading up towards the road where glorious views across the fells lent some distraction to the general discomfort. We turned off the road at the cattle grid at Holly Hall where the course became a veritable mud bath, before heading through Mill Wood and emerging in Hurst Green at the top of the Avenue for the final stretch. Jasper Johnson running for the Ampleforth boys’ team came first in the race followed by Will Metcalf OS 15 with competitive times. Hugh-Guy Lorriman was the first in for the OAs and his wife Mary-Maye OS 98 the first lady runner in. All in all it was a convincing victory for the OS over the OA, with Ampleforth taking the honours in the boy’s race. There were notable performances from James Ashworth who came 5th (despite claiming lack of training before the race! ), Richard Kenyon OS 98 and Stephen Belderbos OS 94. Harry Dickinson OS 94 and Al de Montfort (who had run 21 miles the day before!) also scored for the OS team. Mike Kelly OS 76 who had not been back to the College since he left in 1976 also ran well. Father Philip Conner OS 92 ran with his dog again, incorrectly identified 2 years ago as a spaniel – it is in fact a breed of Lake District sheep dog or cur or so I am told! Match tea followed the race where the Christopher Newton-Carter Trophy was presented to the OS. A brief background was also given on Christopher Newton-Carter (Old Beaumont and OS) who ran in the inaugural Stonyhurst/Ampleforth cross-country race 52 years ago and was later killed in the 9/11 attacks. Afterwards many of the runners gathered at the Bayley Arms to watch Scotland unexpectedly thump England at the rugby. Drinks and dinner followed at St Mary’s Hall where spirits were clearly high because there were no less than 7 speeches delivered including one from Simon Andrews as Chairman of the Stonyhurst Association and Declan Richardson on behalf of the College cross-country team. 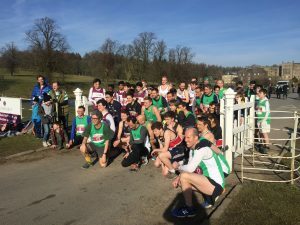 Stonyhurst and Ampleforth were toasted in turn, Hugh Sherbrook (OA) toasted Father Edward Corbould OSB who was his inspirational cross-country coach at Ampleforth and James Podevyn OS 98 toasted “Quant Je Puis”! Hugh Sherbrooke (OA) won the oldest runner award (he is 70 in August) and Father Philip Conner the priest and dog award! Beverley Sillitoe was presented with a bottle of champagne to thank her for her tireless hard work in organising this weekend and thanks were also given to the SMH catering staff for producing such a feast. We are very grateful to Paul Wilmore (master in charge of cross-country at Stonyhurst) for his hard work in organising the race, the Association and the College for covering the cost of the dinner and to Joe Reed for his excellent tour of the Arundel Library and school museum which was enjoyed by all who attended. We are also very grateful to Gilbert Conner who again acted as unofficial photographer for the event. This race has become very much of a family event. However, the Conner family deserve special mention with Gilbert acting as photographer, his wife Caroline supporting, his son Father Philip and his daughter Mary-Maye running for the OS and his son-in-law Hugh-Guy Lorriman running for the OA with their five children also supporting! Also worthy of mention are the Wylie-Carrick family with Michael Wylie-Carrick OS 79 and his two sons who are pupils at the College all running and his wife Ayten supporting and attending the dinner. All in all this was an highly enjoyable weekend and I would urge you all to run next year at Ampleforth as it is far more challenging to win the away fixture! OS Croquet v College Pupils and Staff at the College. Time to be confirmed.